After reading some accident statistics about some of the leading causes of crashes, we think two causes that are appropriate to discuss and review during this time of year are the increased risk of night flying and the increased risk of controlled flight into terrain (CFIT) during night flying. The dangers of night flight are well known. No, we are not saying that flying at night is any different in terms of aircraft performance than flying during the day, although night flight might be smoother because of the lack of convective thermal activity. Frankly, the aircraft doesn't care if it is flying with or without benefit of sunlight, unless you consider the possible benefit of a lower density altitude because of the normally lower temperatures at night. No, the risks of night flight are not aircraft related. The risks are people related. The problem is two-fold. One is the increased risk that a night off-airport landing poses. Simply stated, in the event of an off-airport precautionary landing there is a greater chance of injury at night because it is more difficult to find a good landing site in the dark. It is hard to land safely where you can't see the rocks and the trees. That problem is summed up in the old story about night emergency off-airport landings, "If you can't see at night, turn on your landing light. If, you don't like what you see, turn it off." Such is the risk of an off-airport landing at night. The other problem may be the greater risk. The human being flying the aircraft is a daytime creature. Humans are not designed to function well at night. For one thing, our night vision is poorer than our day vision, plus it is subject to various nighttime induced illusions. Humans are also more active during daylight hours which means we like to sleep when it is dark. Adding to the natural physical limitations that humans have at night, humans also suffer an even more serious problem as the 21st Century looms on the horizon: CLOCK-I-TIS. Or more precisely, our fascination and commitment to managing our lives by the clock. The problem is our religious-like dedication to the clock controls us to the point where we can become a safety risk. Our desire to get home on time at all cost is one example. Another example is the fact that many general aviation (GA) pilots flying at night are not professional pilots with duty and rest requirements and limitations. We are not saying GA pilots are not good pilots. We are saying that in many cases, GA pilots flying themselves at night have worked a long, full, workday and are flying either to return home after a business trip, or they are flying for personal reasons such as maintaining their night currency after a 10 to 15 hour or longer workday. during an extended business trip. With fatigue comes the chance that the pilot is not as sharp as possible. Pilot judgement may suffer. The pilot's reflexes are slowed. The pilot's night vision is not as good as during the day. And the pilot's need for oxygen at lower altitudes increases. These and other such physiological factors may combine to cause an accident that might not have happened during the day. So what can be done to combat potential night related accidents. The first is to realize there is a greater risk when flying at night. That risk becomes even greater during the winter months when the hours of darkness are longer and the survival dangers posed by winter conditions are greater. In our opinion, the single-pilot flying at night without passengers is at the greatest risk because if the pilot is fatigued or bored, there is a greater danger of the pilot falling asleep en route. There have been accidents where it is speculated that the pilot was flying on autopilot, fell asleep, and while asleep overflew the intended point of landing and the aircraft crashed when it ran out of fuel. If not true, how else can you explain why a healthy pilot flying a good aircraft crashes after a long work day along an extended line drawn from the departure point through the point of intended landing. Another survival safety technique at night is having someone else onboard who can help keep you awake and keep the flight interesting. Another is to simply not fly at night if you are tired. Another is to raise your own personal safety minimums at night such as higher weather requirements and more fuel. Again, if you don't feel safe and sharp, don't fly. Another is to schedule night proficiency flying on a non-workday so you can get a good night's sleep the night before, and you have all day to get to the airport. Besides, preflight inspections are much easier done in daylight. The following story illustrates some of the problems of flying at night. Recently a pilot told us about a night flight he once made in Montana where he mistook the sun rising under a layer of clouds for the lights of a distant town. After adjusting his heading to fly toward the "lights" on the horizon, he finally realized it was the sun being diffused by clouds rather than lights from the town. He said several factors contributed to his mistake. He was tired because he was returning from a charter flight where he had to spend several hours on the ground between the outbound and inbound portions of the flight. Another factor was there were only a few towns along his flight path eparated by miles of darkness with nothing in between. So it was natural for him to think the light on the horizon was a small town he knew was in that general direction. Adding to the illusion was the fact the sun was rising through a cloud layer that hid the sun's classic silhouette. Finally, his awareness increased to the point where he realized his instruments were in fact indicating he really was off-course, and he finally recognized the sun's shape as it slowly became more visible. He realized his error and corrected his course. Fortunately, this story has a happy ending. But suppose there had been a mountain or obstacle along the off-course route, would the tired pilot have realized his mistake in enough time to avoid a CFIT accident? We will never know, but we wonder how pilots have crashed in similar circumstance. Night flying accidents are not unique to GA pilots. A major TV network made a movie about a Canadian military crew that canceled their IFR flight plan and its inherent air traffic control protection to make a night VFR descent and landing at a remote airbase in the far north on a dark winter night. The crew descended into a black hole and hit a mountain top hidden by the darkness. The error the crew made was in not using all available flight aids instead of their eyes at night. As said earlier, the human eye is not that good at night. The Aeronautical Information Manual (AIM) says the human pilot is subject to many problems in flight that can be deadly. For example, Paragraph 8-1-5 says illusions rank among the most common factors contributing to fatal accidents. The AIM says the following illusions can cause spatial disorientation: The Leans, Coriolis Illusion, Graveyard Spin, Graveyard Spiral, Somatogravic Illusion, Inversion Illusion, Elevator Illusion, False Horizon, and Autokinesis. The AIM also says the following illusions can lead to landing errors: Runway Width Illusion, Runway and Terrain Slopes Illusion, Featureless Terrain Illusions, Atmospheric Illusions, and Ground Lighting Illusions. The AIM also discusses the problems of reading flight charts at night or in dim light, night vision adaptation, the problem with night vision adaptation above 5,000 feet cabin pressures, the effects of carbon monoxide from smoking and exhaust gases, and the problem of the lack of Vitamin A in your diet and its effect on your night vision adaptation. The best defenses against many of the illusions listed include being aware they exist and to be prepared for them; having and using an instrument rating; checking and using all available data on your route of flight and airport of intended landing; having VFR charts available when flying IFR to visualize the terrain and airport information better; and using all available pilot aids such as runway approach lights, visual approach slope indicators such as VASI, airport runway lighting, and any other available landing services such as ATC terminal approach control radar. One of the best defenses against many of the landing illusions is in every aircraft cockpit. Your altimeter is one of your best landing instruments both during the day and at night. As long as it is properly set and used, it will give you your height above sea level regardless of terrain or airport illusions. As long as you know the airport's elevation and surrounding terrain, you can compute the altitude you need for a standard approach. 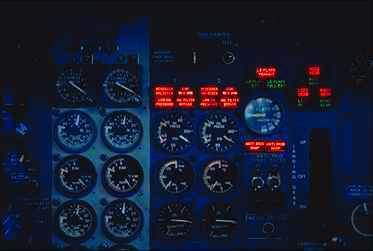 As long as you keep your cockpit right side up and your height above any objects equal to or greater than the minimums, you should not have any problems flying at night provided you keep alert and awake and don't run out of fuel. The key to staying out of the trees is keeping alert. Always remember, it is the mountain you don't see that will probably kill you at night. So be aware of your altitude, keep your situational awareness and know exactly where you are, avoid flying into terrain, and always land on the first third of the runway. Have a safe winter of night flying.